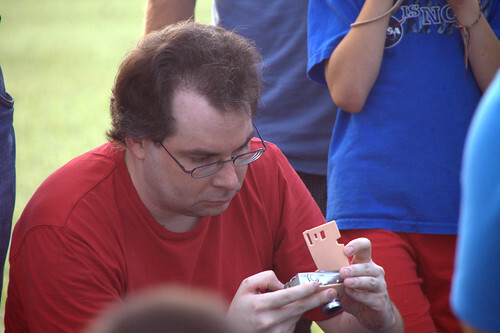 I’m going to be playing Maker Faire NC 6/18/11 at ~12:30pm in the Kerr Building at NC State Fairgrounds. I’ll be bringing the Stochasticaster, the Heart Kalimba, Kalimbateeny, Kalmibazooka, the de-fretted guitar, and whatever else I can find or finish in the meantime. For the performance at the 919noise showcase, I built an instrument based on a cross between a guitar, a kalimba, and a spring reverb tank. I wanted a physical sounds source as opposed to something electronic or digital. 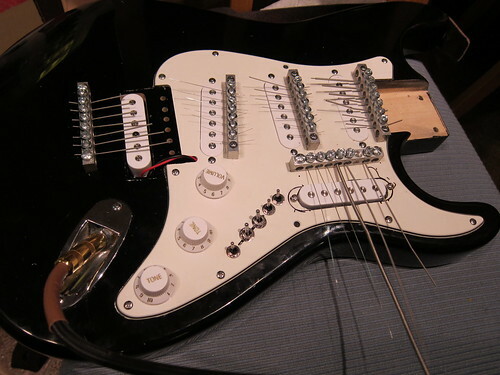 In this case, magnetic pickups with strings resonating in them like a regular electric guitar. Long loose strings for reverb type sounds, short strings for kalimba like tones. 34 strings/tines in total, 5 single coil pickups, 5 bridges. String gauge range from .09 inch (typically the high E string on a guitar), all the way down to a .106 inch string (typically low E string on a bass guitar). Bridges were the same style of electrical panel grounding bars as I used on the Kalimbazooka. Unlike the Kalimbazooka, this used the more flexible electric guitar strings for the tines, which made it somewhat difficult to tune. The strings were very sensitive to the exposed length, which was difficult to get right. I got it mostly at tune at one point, but it drifted quickly, and I ended up forgetting about trying to tune it to a particular set of notes. Oh well, it makes cool noise. Built it in a week or two. Not sure I learned to play it as well as I would like, but I wanted something new and interesting. I guess with this kind of thing, the main thing to figure out is how it interacts with the amps and feedback, which I thought I had figured out. I played first after a couple minutes of soundcheck. One of the first problems I ran into was the buzz/hum. Lots of it. The type of pickups in it (single coils) have a tendency to buzz a bit, but in normal guitars, only one is on at a time. I had 5 of them. 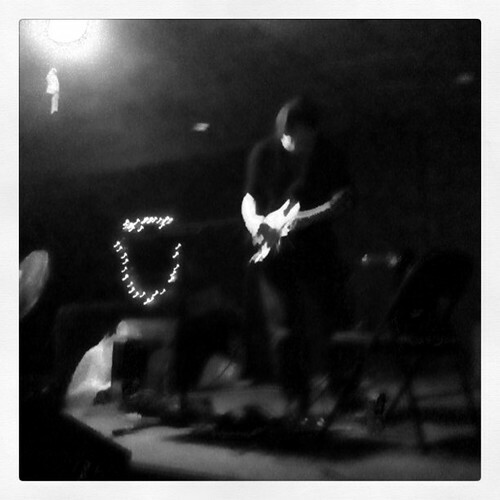 That plus some long wires, bad shielding on the cheap donor guitar, and I had a pretty loud buzz. Could be worse, it was a noise show at least. I’ve got some ideas on how to fix it though. The high noise floor made it a little hard to use as much dynamics as I would have like. Quieter things got washed away in the noise. So less subtlety was called for. Was nervous about it as usual, and rushed stuff. 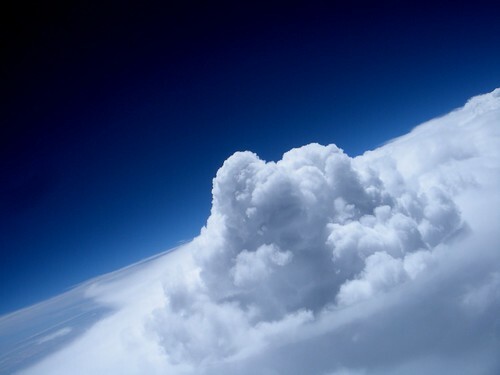 Not particularly a good habit for noise/ambient/drone, hopefully it works for me. Seemed to get a good response, and folks were curious and complimentary about the instrument. 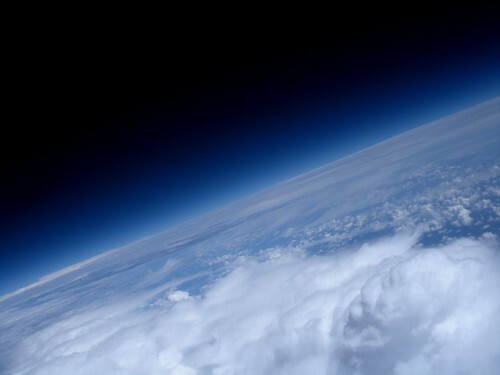 I’ve been working with a team from Tech Shop RDU to put together a helium balloon as part of the Hackerspaces in Space contest. 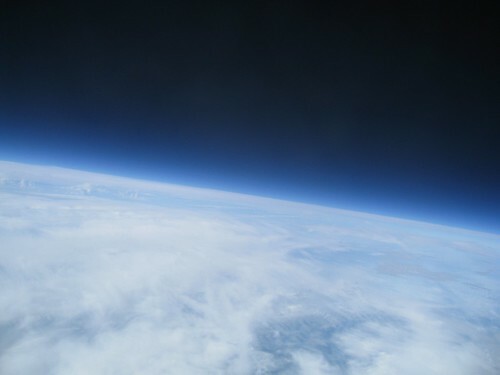 Basic idea, build a balloon with a camera and gps, and try to get pictures of the curvature of the earth and the blackness of space. And I think we did. 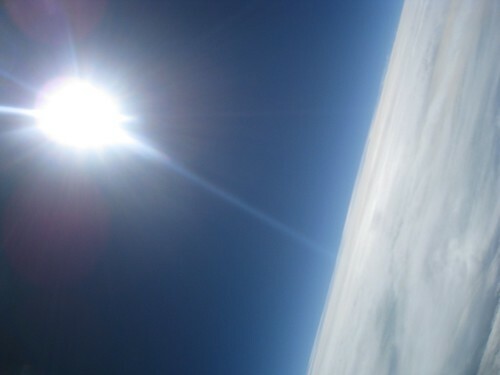 We actually made two launches, the first included my camera (Canon sd850, running CHDK firmware, and a script to take a pic every 15 seconds and log some basic data). 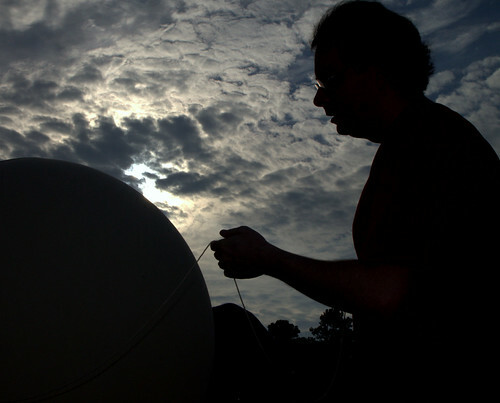 We thought we lost it after the gps transmitting via a ham radio data connectio stopped transmitting, but someone found it in Wendell, NC and called us. 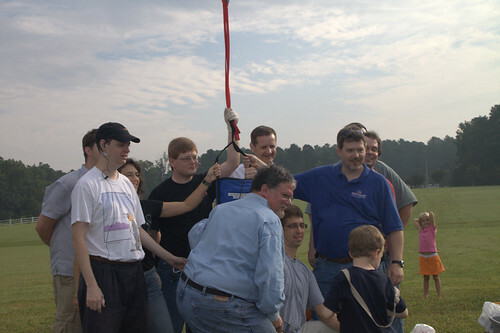 The team also made a second launch that day. We thought the first one was long gone, so put together a second launch from spare parts. I had to leave early so didn’t get to help out with the second launch though. Mk II was a simpler setup, with just a Spot gps tracker and a nikon point and shoot camera with a built in intervalometer. It looks like it was able to fly a little higher, probably due to the reduced weight (first capsule was about 3.5lbs, I think the second one was closer to 2). 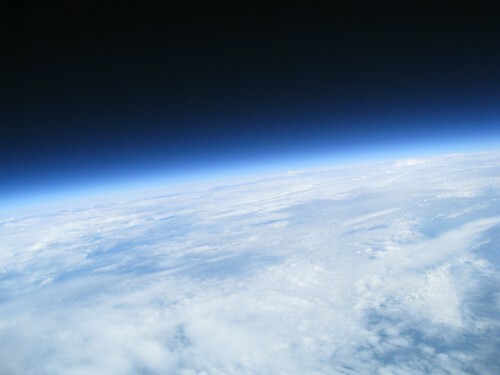 I think the current estimate for the second balloon launch is somewhere in the 80,000 ft range. 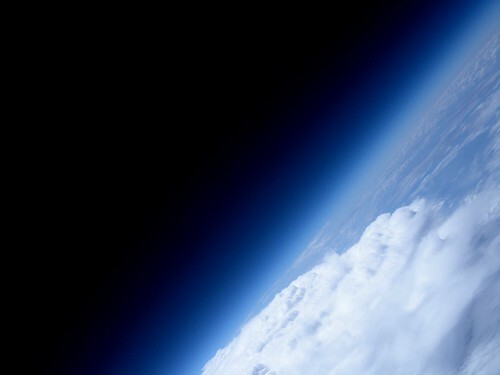 It is definately high enough to see the curvature of the earth and the thinning and the black of space in the photos. We had a lot of people show up to watch the first launch. I’m on a bit of a trend. 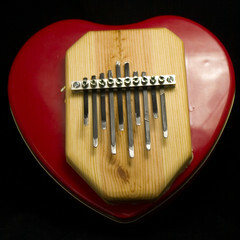 This was built as a belated Valentines day gift so it was made from a heart shaped candy box. 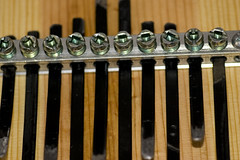 The main set of tines use a busbar, just like the kalimba’s on the kalimbazooka. The pine sounding board and metal resonator gives it a pretty good sound. It is tuned to two octaves of a pentatonic C major scale.